Need some extra attitude in your life? Need a new name for Instagram, Snapchat or YouTube? 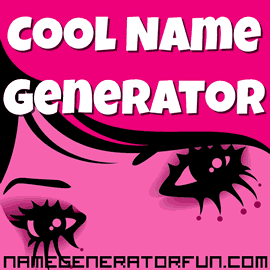 Then create an edgy new alias with our screen name generator! Our generator is great for creating screen names that will grab the attention and conjure up a sense of punky, badass style. If you're gaming, taking pictures on Instagram, hanging out on social media, or just aiming to start a new YouTube channel, we can give you what you need to stand out from the crowd! We've written this page so you can make male, female, and neutral-sounding names that are dark, emo and edgy. Whether you want a cool character name for a story you're writing, an author pseudonym, or a rock star alter ego for your band, we hope our generator will help you create an online identity that's as unique as the individual who will wear it. Cool is a state of mind, a style of dress, and a way of being that's been around for a very long time. It's also an idea that can change drastically between different cultures – for example, African societies in the 15th century used 'cool' (or 'Itutu', as they called it) as an idea that meant kindness, grace and generosity, as well as the ability to quickly stop conflicts or disputes from happening. The sections of Japan's culture that relate to samurai also have their own distinct sense of 'cool', depicting characters with a sense of restraint and power. However, much of our modern-day ideas of 'cool' were formed in the early Twentieth Century, by European avant-garde intellectuals and America's jazz culture. In the aftermath of the First World War, much of Europe entered a phase of decadent culture – particularly Germany during the years of the 'Weimar Republic', when progressive art and politics exploded into life. At the same time, experimental artists like the Dadaists set out to scandalize the establishment, and ideas of rebelling against the traditional order were being put into action, especially in works like The Threepenny Opera by experimental playwright Bertolt Brecht. Standing apart from the crowd started to become a positive thing worth aspiring to. Elsewhere, in America, the direct concept of 'cool' arose through Jazz clubs, and is seen as having been originally defined by tenor saxophonist Lester Young, who used the phrase “I'm cool,” to denote being both in control and relaxed while playing. By the 1920s, cool was already a word that delineated approval and even reverence, and by the 1940s phrases like 'cool cat' were in common usage. At the same time, Hollywood movies started to explore the allure of the rebellious outsider, and the hard-boiled genre of Film Noir gave us iconic detective heroes that further defined the idea of cool. Cool was seen as a characterization of individualism, inner contentment and detachment, and was displayed by people rebelling against everyday life, or by those on the outskirts of society. It had its roots firmly in Black culture, especially in the way that ironic submission or concealed rebellion was often used during the history of slavery in the US, as well as the civil rights struggles that followed. This, combined with the idea of a more laid-back approach to life, also went hand-in-hand with the eventual birth of 'beatnik' culture and the rise of more explicit teenage rebellion in the 1950s that eventually led to the counter-culture of the 1960s. Being cool meant hanging out, sexual freedom, and wanting to escape ideological causes, all of which were extremely attractive to teenagers growing up in the wake of the Second World War. This led to a level of rebellion against the establishment – especially in the world of fashion, which in the immediate post-war years was dominated by an extremely conservative approach. Those wanting to be 'cool' in the 1950s would avoid mass-produced fashions in favor of styles that more deliberately stood out from the crowd, often hand-making their clothes in order to rebel against consumerism, leading eventually to the bohemian approach of the Hippie movement in the 1960s. These ideas of cool were spread further by the explosion of pop music in the 1950s and 60s, most of which had its roots in Black culture via the influence of Jazz and Blues music. Cool has tightened its grip on culture ever since, as the 1960s turned into the 1970s and 1980s, growing from a rebellious minority into a dominant force. Other, similar slang words like groovy, phat or awesome have waned or fallen by the wayside, but cool remains a concept that everybody is instinctively familiar with. There are distinct modes of cool, named by Australian psychologist Ilan Dar-Nimrod as cachet cool (warmth, friendliness, attractiveness, desirability) and contrarian cool (irony, toughness, rebelliousness), and almost every figure seen as 'cool' falls somewhere into these categories. Things that are 'cool' are seen as desirable, new, contemporary, and in vogue – the classifications may change across the years, but the definition of 'cool' remains the same.